While the term ‘hypergrowth’ was only coined relatively recently, it is in increasingly common use thanks to the successes of headline-stealing companies such as internet media giant BuzzFeed and taxi-hailing app Uber. In just a few short years, both these businesses have totally disrupted and transformed the industries in which they operate. Uber, founded in 2009, took just three years to reach a valuation of $18.2 billion, while Buzzfeed was founded in 2006 and currently claims 200 million monthly unique users and 6 billion content views. These are two particularly well-publicized examples of hypergrowth companies – companies that are growing way faster than their peers – but hypergrowth is not just the preserve of the famous and the few. There are many more hypergrowth companies operating in a wide range of sectors right across the world. Hypergrowth is defined as a compound annual growth rate of 40% or more, so companies with this level of growth typically double their revenues in less than two years. Often their rapid expansion is made possible by technological advances that allow them to create new possibilities and compete on a global scale. Many people associate hypergrowth with young, risk-taking companies that capitalize on a gap in the market or see the potential for a new business model. Yet the evidence suggests that not all hypergrowth companies are young or disruptive. Hypergrowth can come about as a result of joint ventures between big businesses and small start-ups, corporate partnerships, and new generations of family business owners following innovative strategies. The World Economic Forum recognizes the significance of hypergrowth to both the way we do business today and the way that we will do it in the future. So it set out to find out how hypergrowth companies differ from other companies in the way they are led and managed, and to learn lessons from those organizations’ successes. Our findings are published in Mastering Hypergrowth, our study of nearly 200 companies from around the world. Perhaps the most significant of our discoveries is this: hypergrowth is not a happy accident – it is not the outcome of people with bright ideas and positive market forces that ‘just happen’ to converge at one point in time. Far from it, in fact. Hypergrowth is actually very deliberate – it is the result of companies focusing on the priorities that will allow them to expand exponentially. In other words, hypergrowth can be cultivated. So how can companies cultivate hypergrowth? During our research we uncovered some important attributes that may put companies on the path to hypergrowth. For example, we found that culturally embedded agility is a vital trait. Hypergrowth companies recognize when they need to respond to market changes and they will do what it takes to overcome the challenges they face. This might involve restructuring the business, clarifying and highlighting its purpose, and transforming its culture. They might need to take advantage of new developments in fields such as additive manufacturing, artificial intelligence, and automation, or they may benefit from innovations in the biological and physical sciences. Furthermore, the circular and sharing economies are providing a spacious arena for growth. Beyond agility, the right business model is a key requirement for scaling. Hypergrowth companies favour simple business models because they know that having complicated governance, operations and supply chain arrangements in place hinders their ability to act quickly and, therefore, to scale. So what constitutes a simple business model? One popular and versatile example is matching markets with an internet-based platform that enables buyers and sellers to meet directly. Hypergrowth companies recognize that people are the most important driver of organizational success. But instead of hunting down candidates with specific skill-sets to fill rigidly defined vacancies in the way that other companies do, hypergrowth companies seek out individuals who are the right cultural match for their own values and purpose. And instead of taking a competency-based approach to recruitment, they look for people with problem-solving and intercultural skills – those who are confident operating in a global environment characterized by constant and rapid change. Regulation is a challenge for over a third (36.7%) of the companies that featured in our study. 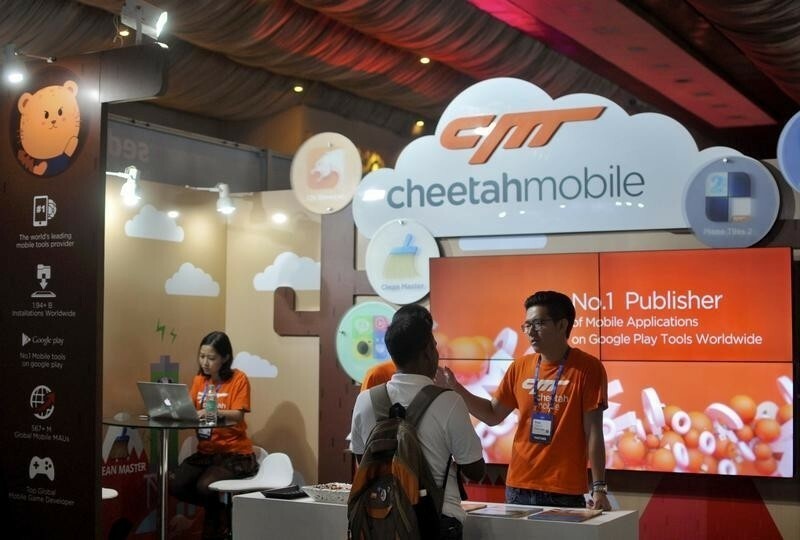 And it can be as much a challenge for a hypergrowth company as any other, especially in Africa, Asia and the Middle East. Yet what distinguishes hypergrowth companies from other companies is that they just don’t let regulation happen to them; instead they actively engage with regulators to help shape regulation. Also, in cases where the boundaries of legality are not entirely clear, they are prepared to start working in an undefined space until clarification and communication are possible. While hypergrowth is associated with technology, not all hypergrowth companies are tech start-ups. 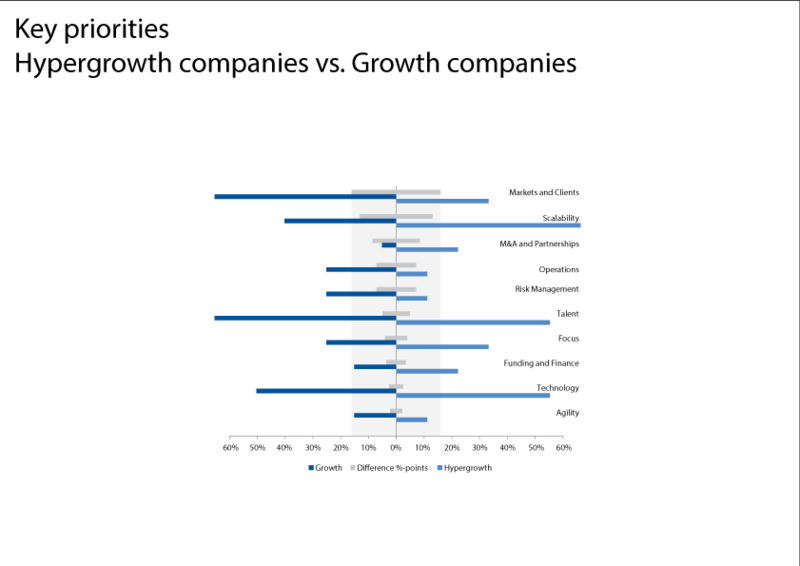 But what differentiates hypergrowth companies from slower-growing businesses is the way in which they use technology. They see technology as an important provider of data, so they collect data and they use it to scale their businesses at a rapid rate. Having a plan for data means they have the confidence to ‘test and trial’. In other words, they go to market with products that are ‘good enough’ because they know that they can use customer data to improve those products at a later date. A company that wants to achieve hypergrowth needs to be willing to scale – and fast. Hence M&A and partnerships tend to be a priority for hypergrowth companies. 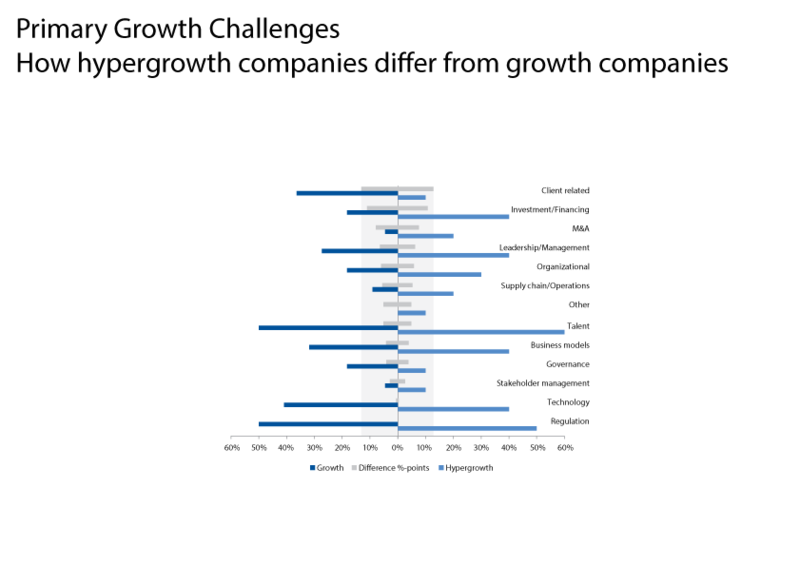 While hypergrowth companies may buy out competitors as an act of self-defense, they are more likely to undertake M&A because they see it as an opportunity. This opportunity may be to expand their market, embrace fresh talent or access crucial new technology. Our research suggests that hypergrowth companies often operate in a market that is in the process of being created or transformed. Alternatively, they may have effectively created their own market by identifying a huge, undiscovered consumer appetite. It is important to remember, however, that definitions of industries and markets may continue to change for some time to come if technology converges as forecast. 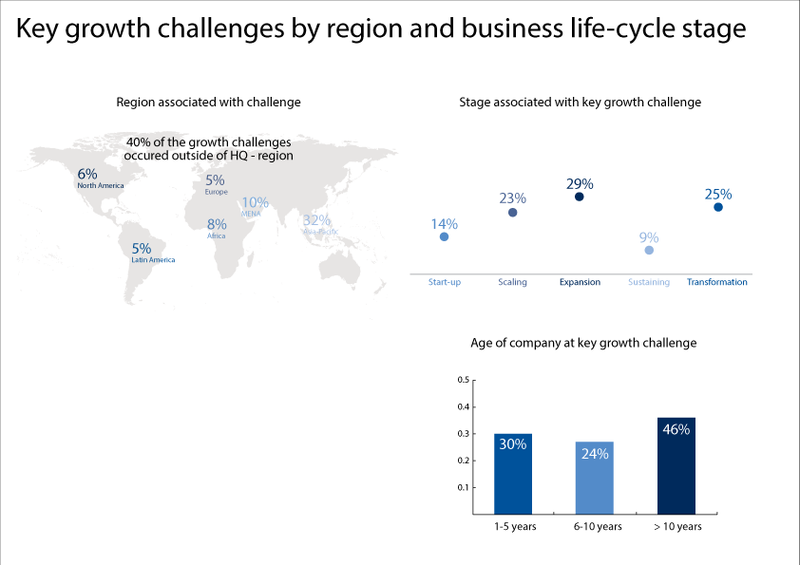 Also, the structural capabilities that allow for high-speed access to global markets could mean that hypergrowth becomes the standard experience for innovative companies with globally relevant products and services. So instead of being a short-lived feature of changing times, hypergrowth may actually be here to stay as an indicator of a company’s overall significance.